Last weekend, we took our 10 year old little wanderer to Siem Reap to show to him one of the most amazing places in the world – the temples of Angkor, the landmark of Cambodia and a UNESCO World Heritage Site. It was our 5th visit but it was even more special because we were showing such magnificent place to our little one for the first time. Angkor was the capital city of the Khmer Empire from the 9th to 15th century. I have learned that it was the largest city in the world from 1010 -1220 with about 0.1% of the world’s population. The Angkor Archaeological Park comprises of several temples such as Angkor Wat, Angkor Thom, Bayon, Ta Prohm, Ta Som, Banteay Srei, and many more, and the ruins are located in the middle of the jungle between farmlands. The temples truly are amazing! And our little explorer was amazed at the beauty of the architecture, craftsmanship, the size and the details of each monument. Even though it was very hot and humid, he was still very energetic and very keen to explore everything, walk within the structure and marvel at the architecture of so long ago. 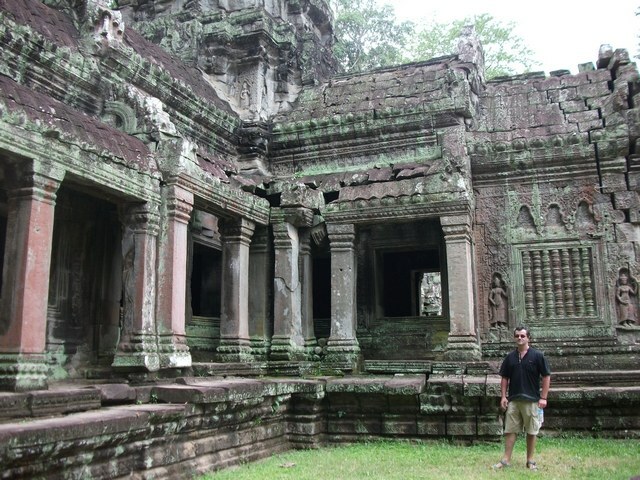 This time, we only visited three temples – Angkor Wat, Bayon, and Ta Prohm. 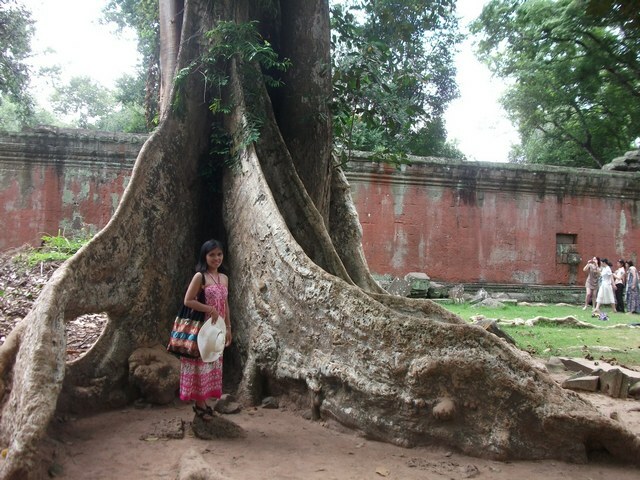 We all love Angkor Wat the most – it is grand and majestic! We went there twice before, during sunrise and sunset and the two visits gave us different feels. 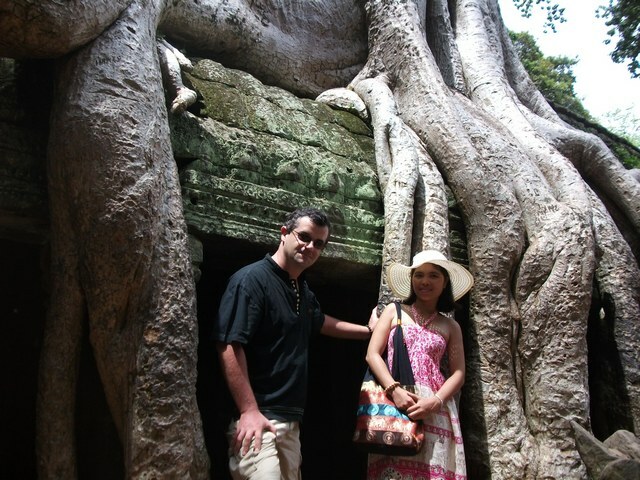 Besides Angkor Wat, we also like Ta Prohm. I think it is the most romantic temple in the entire complex as you could feel the joint venture between nature and architecture merging into the forest. Pete, our little navigator was mesmerized by the several hundred years old trees and the way they were going out of the ancient ruins. It is incredible to think that this has been hidden for centuries. We also enjoyed visiting Bayon Temple, the cutest of them all – it’s mystical, charming and you could see huge smiling Buddha faces everywhere. Places like this certainly remain in our hearts forever and it is a wonder that you must see to experience it as pictures do not give it justice. I strongly believe you must spend a minimum of 2 days and longer would be more preferable. Entrance fees – 1 day=$37. 3 days=$62, 7 days= $72. Children below 12 years old don’t have to pay the entrance fee. Bring your child’s passport to show to the security otherwise you’ll have to pay for the admission fees. Tuktuk charge for a day tour in Angkor complex is $15. Wear proper clothes – no sleeveless, no shorts. 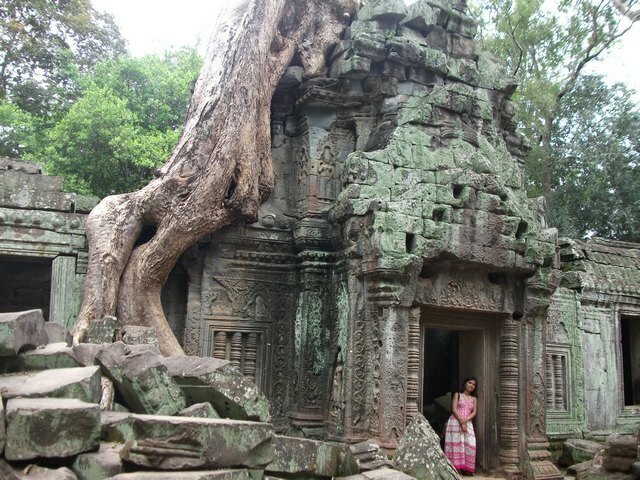 Some temples like Angkor Wat, Baphoun, etc do not allow you to get inside if you are not properly dressed. Wear comfortable shoes for walking because you have to walk a lot. Bring a bottle of water to keep you from dehydration. Bring a towel, an extra tee-shirt, a hat or an umbrella. Bring a camera. There’s a lot opportunity to take good pictures. 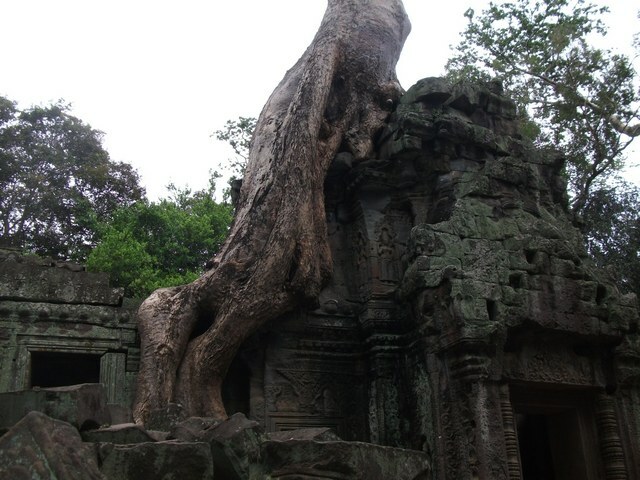 Ta Phrom Temple is unique. 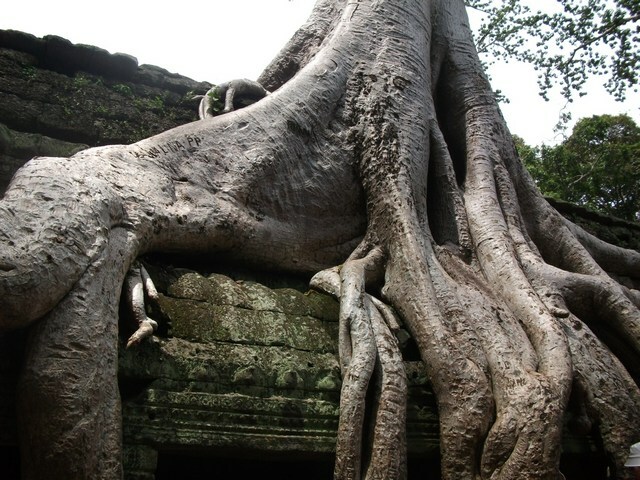 It is famous for its wonderful huge old trees growing through, over and around the temples that are hundreds of years old. 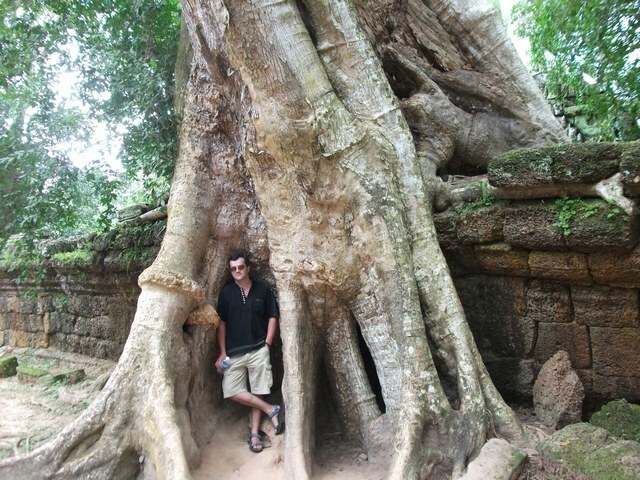 King Jayavarman VII built Ta Phrom Temple in 1186 AD. It was a Buddhist temple dedicated to his mother. 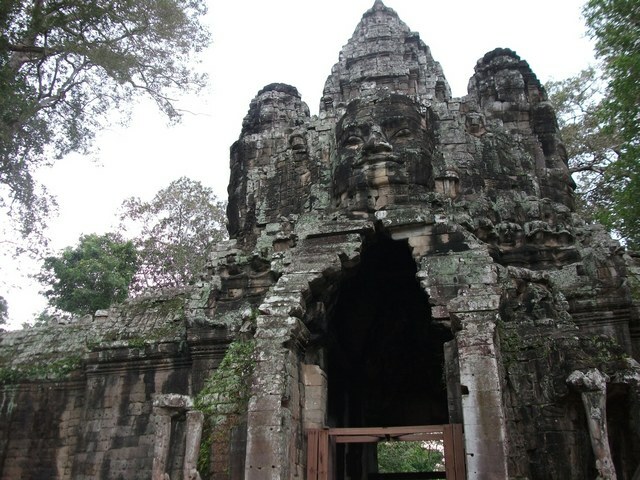 It is one of the massive temples in the Angkor complex. The natural surroundings of the temple give a splendid feeling to the whole temple experience. We were amazed by the simplicity of this temple. We liked the bizarre growth of the trees; some of them have huge tall roots between which you could build a small house. We enjoyed looking at the trees growing on top of the stone walls. We savored seeing some lichens, mosses and other creeping plants delicately carved on the walls. We adored the way the roots coiling around the stone walls; it shows how nature has reclaimed the land. 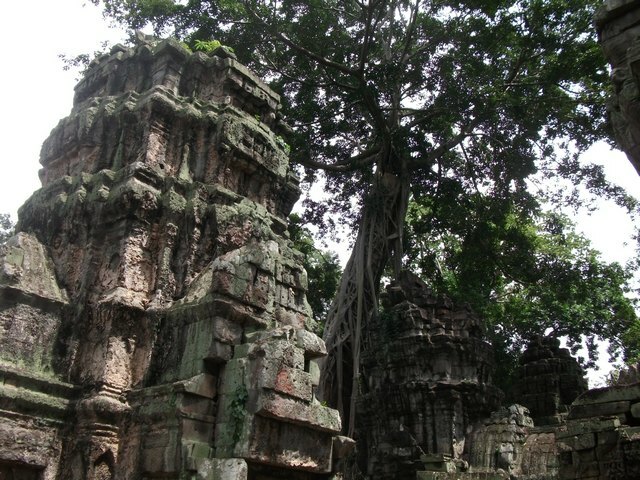 All these gave us a great impression and gave us a sense of how it would have looked like discovering Ta Phrom Temple for the first time after it had been abandoned for four to five hundred years. This is really something to behold. We went there in the afternoon. We found it a good timing because the leaves filter the sunlight and welcomed us with enough shade while casting some greenish light. We took many good pictures since the sun shone a fabulous glow on the trees and the temple. This ancient temple has continuously been receiving thronging crowds since parts of the Tomb Raider movie starring Angelina Jolie was filmed here. 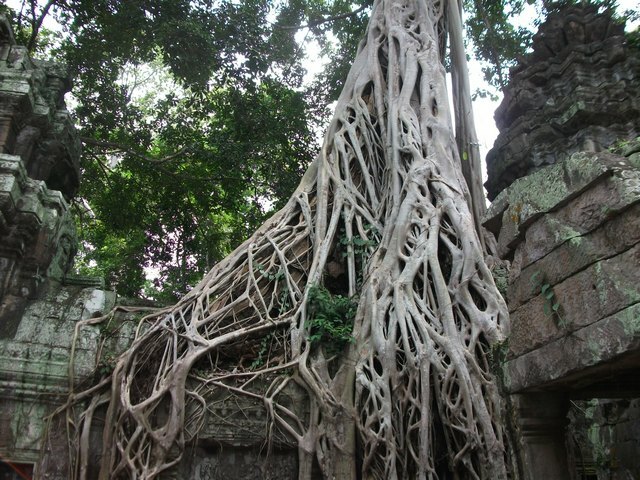 Even though it gets busier and busier as everyone wants to see the trees, everyone gets a turn and you can still find your own mysterious space and entangling roots with the temple. 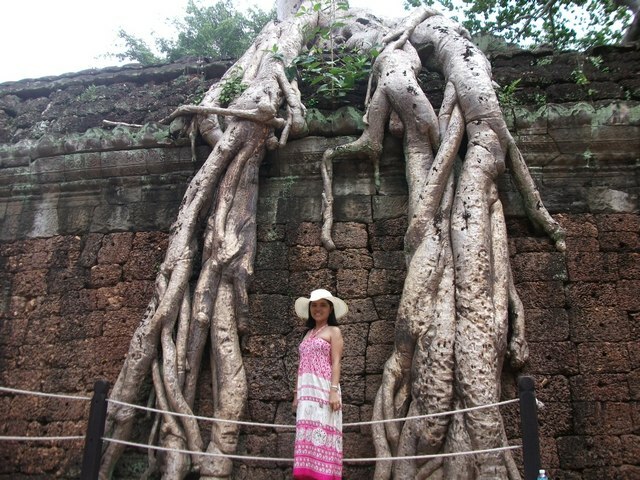 If you love history and photography and if you dream about such mysterious places, Ta Phrom is the perfect place for you. The Bayon Temple is my most favorite temple besides Angkor Wat in the Angkor Archeological Park even though each temple has a special something. It is one of the most enigmatic and ambiguously strong religious constructions. Today, the temple is best known for the gigantic stone face sculptures. 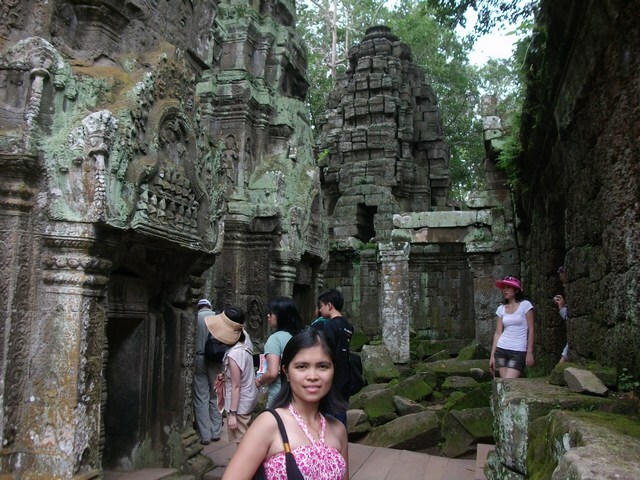 This was taken during my first visit in Angkor Thom in October 2010. The Bayon Temple is located at the centre of Angkor Thom. It was built during the late 12th century and early 13th century, about 100 years after they built Angkor Wat, during the reign of the famous King Jayavarman VII. It is considered as the second most important temple in Cambodia after Angkor Wat because it is a Buddhist temple consecrated to the Buddhist cult. As part of the Angkor Archaeological Park, Bayon Temple has been famous for its amazing collection of Buddha large, serene, smiling stone faces found on each towers. I have learned that there are about 54 towers which represent the Khmer provinces in the Great Khmer Empire period. I have also learned that there are about 200 faces which symbolize different Buddha smiling faces such as beautiful smile, glad smile, sad smile and charming smile. And, these different stone faces in the walls surely amaze each tourist. When we visited the Bayon Temple, I could feel the splendor and the magic from the people living during those ancient times who were able to construct all these amazing temples in the Angkor Kingdom. I loved the many smiling Buddhas in this temple. It was so peaceful and quiet. We climbed to the top of the tier of the Bayon Temple and we found great views of the tree canopy and some bird spotting. We captured a lot of beautiful pictures in there. We saw some workers who were restoring this beautiful architecture. I would say that this place is an exceptional architectural heritage. The details that went into carving the faces from stones are spectacular. It was a unique experience and a pleasure to photograph. To me, the architecture plan is one of the greatest in the world. Have you found the most smiling face?